We have made it to Santiago without too many issues. It was a massive effort to leave home. The last 3 days before departure were quite stressful for Gill and me. To pack everything for a long term bicycle tour is not easy in itself, but to then add on top the packing up of half the house meant three very long days. 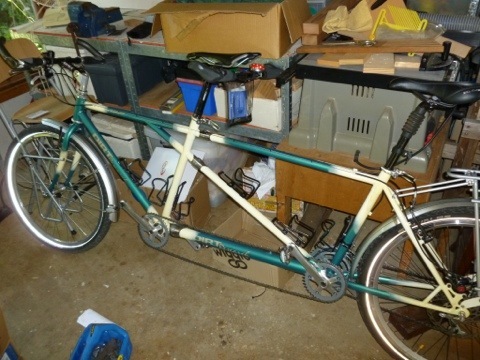 In the last week, the tandem arrived back from the frame shop and needed to be painted – I could find no powder coat business open for business in Brisbane during the first week after New Year and therefore resorted to doing the job myself. Anyone who has done amateur paintwork will know that this is no trivial task. I went through about 10 small spray cans and by then end my index finger was cramping from the effort and my brain spinning from the “reduced toxicity” fumes. The first few coats were careful and considered, but by the 8th coat I had completely lost any intention for a respectable finish – there were runs and wrinkles everywhere and the original bright white highlights were disappearing to a shiny dirty cream after the forth clear coat. After 2 days of “drying” in the Brisbane humidity, I completed full assembly of the bike – still with tacky bits. Poppy and I did one test ride of about 200 yards up the road and back before disassembly and packing began. This activity involved chipping off much of the paint applied in the last few days! The good news is that the rear disc brake conversion done as part of the frame modifications seems to be successful. The hub for the new rear wheel arrived from the US at the last possible moment after a 6 week wait for delivery over Christmas. I am somewhat embarrassed to admit that I did have to resort to reading the installation instructions in order to achieve any real brake performance! Poppy and I now have 2 rear brakes to try and avoid overheating. Unfortunately not everything turned up on time. Gill was very disappointed not to receive new prescription sunglasses before departure – they were over a week late on the estimated delivery date. She will struggle on with her old prescription, probably until we get to Europe. Big thanks to friends and family who have helped us out over the last couple of days. In particular, thanks to Cris and Tracey who brought round food during our last evening of frantic packing and who also took us to the airport at 5am the next morning.We have with us way too much stuff and I could see the look of disbelief on Cris’s face when we lifted the final selection of luggage on to the airport trolley! It. Will take some time to whittle down to the things we really value and can actually carry up a 20% gradient. I was personally happy that I persuaded Poppy to leave behind a 56 colour makeup kit in favour of a smaller 10 colour option! Anyway, we are now relaxing and recovering from long flights in sunny and warm Santiago. We have booked three nights in a central hostel to prepare and plan in more detail for the coming 3 months. Interestingly, we met with another cycling couple on our flight intending to do a similar journey on the Caraterra Austral. They are flying south and cycling north, so we will possibly catch up with them in the next month as we head south. I think the route will be bustling with other cyclists.